DMK’s party publication panned Kamal Haasan by alluding to his Brahminical roots to suggest that he is a casteist. Chennai: The DMK is at it again. A few months ago, DMK’s party organ Murasoli fulminated at Rajinikanth. Now, the same Murasoli has foamed at the mouth over Kamal Haasan. The Dravidian party which then branded Rajinikanth as a BJP agent has now labelled Kamal as a creation of the BJP. While the DMK’s criticism of its political opponents is understandable, the acid-tongued nature of its attack on Kamal today has many people shaking their heads in utter disgust. DMK’s vicious charge is utterly bigoted as it is highly casteist. Kamal in his recent interviews had said that he saw no difference between the AIADMK and the DMK when it came to corruption. 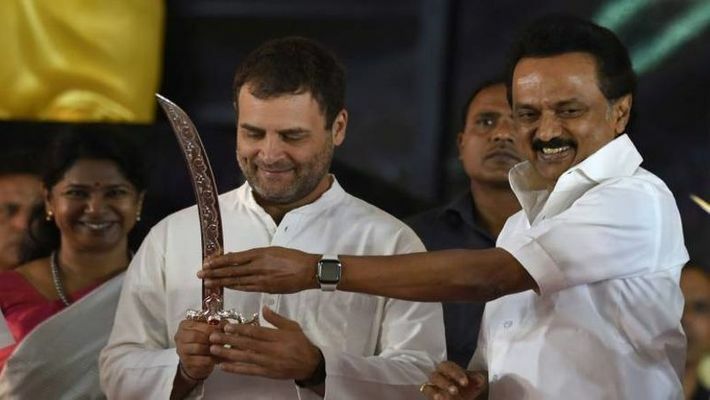 Terming the DMK as dirty, Kamal said his party (Makkal Neethi Maiam) would not touch it (the DMK) even with a bargepole. Kamal also criticised DMK chief MK Stalin, suggesting that he was no cleaner on corruption issues. Kamal, for the record, had shared a cosy relationship with the DMK patriarch M Karunanidhi till the latter passed away last year. Kamal was one of the special invitees and speakers for the platinum jubilee function of Murasoli. In the backdrop of this, Kamal speaking out against the DMK was always going to get a quick response from the DMK. But the manner in which it has chosen to hit back is the point of discussion. The DMK has alluded to Kamal’s Brahminical roots and accused him of ‘showing his true colours’. The language that Murasoli has used against Kamal is almost un-translatable if its spirit and sentiments have to be interpreted, but there’s enough to suggest that it is bigoted and venomous. As said, the DMK has a right to question Kamal’s claims. It has every right to slam him back. But why pick Kamal’s caste, especially since when he is avowedly an atheist and has openly disowned his Brahminical roots several times? Kamal, in fact, has always claimed himself to be a Periyarite and a rationalist. But targeting people based on their caste is not new to the DMK. It has a huge history of making such sordid attacks, especially against Brahmins. If the DMK can use such language against a man who claims himself to be a non-believer, imagine what it would be for others who are theists. The hypocrisy of the DMK rests in the fact that it generally paints itself as one being above caste and creed. Murasoli’s prose also reached for the gutter and likened Kamal to donkey, and also ox (boom boom maadu). When Murasoli took potshots at Rajini, Stalin reportedly had to personally call him and apologise. That verbal fusillade was not as vitiated as the one against Kamal. It remains to be seen what Stalin does after this. Anyway, after the death of J Jayalalithaa and M Karunanidhi people in Tamil Nadu were expecting politics, which had sadly become highly personal and pungent, to get better. Alas, the no-holds-barred attacks by Murasoli has put paid to those lofty hopes. How has Kamal Haasan's party MNM performed in one year? Has Kamal Haasan alienated allies with his childish politics?